From Twisted Pine Brewing Co. The Stone Smoked Porter with Chipotle Peppers left behind a little tingle of capsascin and pepper. THIS one I was scared of. 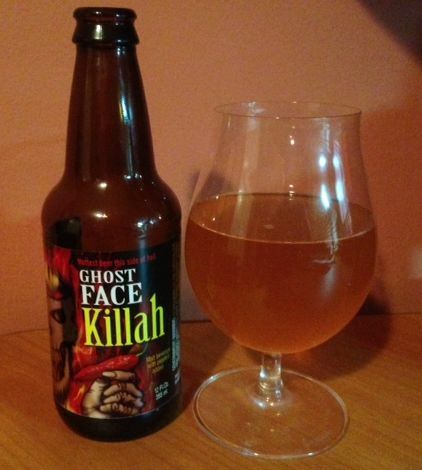 This one describes itself as the “Hottest beer this side of hell.” Six kinds of hot chili pepper: anaheim, fresno, jalapeno, serrano, habanero, and <drum roll> ghost! In the glass it’s a pretty apricot color with almost no bubbles. Brought to the nose…Christ that’s hot! Intense hot pepper aroma, felt on the roof of my mouth even though my mouth was closed. Eyes burning a little, blinking and a hint of tears. I’m going to DRINK this stuff??? Taking a sip, there’s a momentary hint of smooth ale, immediately hammered into the ground by a mother load of peppers. The heat arrives immediately and sweeps across whatever parts of your mouth you allowed it to touch. No malt, no sweetness, no hops, no mere spice, just scalding heat . . . and then, as the fire dies down, a wave of pepper flavor. No, this isn’t all heat and no flavor, it’s all heat and chili peppers. I managed to drink about half of the bottle, slowly, but at that point enough was enough. I had heard the suggestion that if it was too hot, use the rest for cooking, but I was done with dinner and I was afraid that the fumes would take the finish off the refrigerator. I used the last 6 ounces to clear the drains. Hopefully the pipes survived. So, do YOU dare try this stuff? I’m glad you tried this so I don’t have to. Not for me!